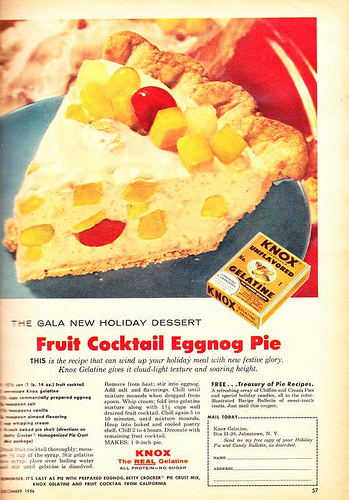 The Knox gelatin recipe for Fruit Cocktail Egg Nog Pie. Drain fruit cocktail thoroughly; measure 1/2 cup of the syrup. Stir gelatin into syrup; place over boiling water and stir until gelatine is dissolved. Remove from heat; stir into eggnog. Add salt and flavorings. Chill until mixture mounds when dropped from spoon. Whip cream; fold into gelatin mixture along with 1 1/2 cups well drained fruit cocktail. Chill again 5 to 10 minutes, until mixture mounds. Heap into baked and cooled pie shell. Chill 2 to 4 hours. Decorate with remaining fruit cocktail.